The increase in tablet and iPad ownership in both businesses and schools has increased dramatically over the last few years. With more organisations embracing digital products such as iPads because of their ability to quickly store and send important information, the need to protect them from loss and theft has become even greater. Thieves are aware of this iPad influx within organisations and with their small and lightweight feel, tablets are easy targets for those who want to steal and sell devices on illegally. IPad theft is rising considerably throughout the UK but with tablet theft accounting for 42% of all crimes reported in London in 2014, the capital has become the biggest target. With tablet theft continuously on the rise, your organisation must take the necessary precautions to protect against thieves looking for a quick buck. 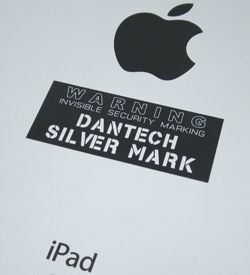 IPad security marking is a quick and easy way to discreetly label your devices, helping to deter thieves and quickly recover goods that have been stolen. IPad security labels are robust stickers that can contain the name of your organisation, as well as phone numbers and tracking numbers. They are perfect for organisations with multiple devices and are incredibly difficult to remove if stolen, making them a great deterrent. Alongside this, they can also be finished with UV ink, so even if the label is somehow removed, your devices can still be tracked. If you want to fully protect your iPads from the threat of theft, you should always invest in a high quality, industry standard label. A low-quality label not only looks cheap but is likely to be less robust and easier to remove, meaning that you could waste money on an inferior product and still be vulnerable to theft. When it comes to protecting your assets, you should never cut corners. By investing in high-quality iPad security marking you could potentially save yourself thousands of pounds in new equipment. Every iPad has a serial number that can be used to track the device if it has been stolen. However, your organisation may not always have these to hand, so you may want to use iPad security marking to create your own iPad inventory. Creating your own inventory with the help of security labels will give you an accurate database to refer back to if your goods are lost or stolen. Whatever way you choose to track your electrical devices, iPad security marking can help you to do it more effectively whilst at the same time, actively deterring thieves.